So, Christmas is finally over and we're all enjoying the gifts we got. Many have recieved an MP3 player, including myself. Unfortunately, I think we're all in trouble as we advance technologically. Don't get me wrong, the MP3 player works wonderfully, but the manual that came with it is nothing more than a good example of how well Babelfish does translation. In fact, I wouldn't be a bit surprised if that's what our friends over in Japan use to make our instruction manuals. I've recently been saving examples of poorly written english. All those years we practiced writing coherent instruction manuals in high school have been put to waste. 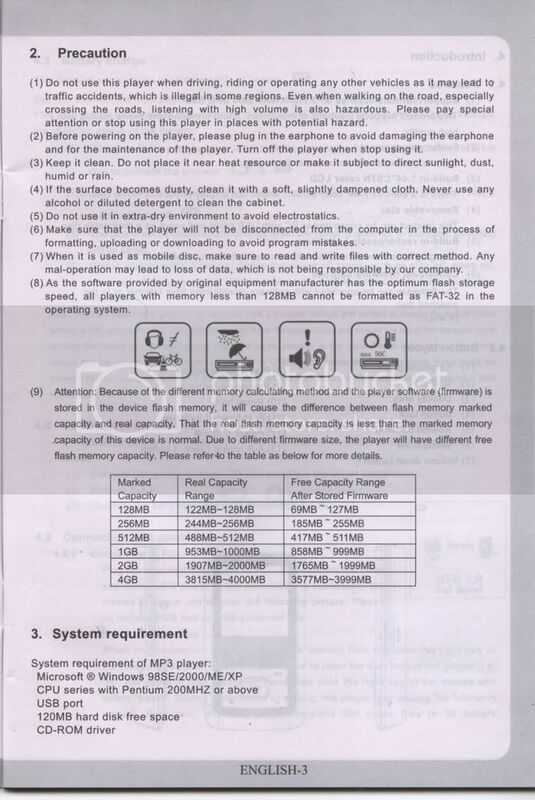 Here's a scan of one page from my MP3 player manual. "Do not use this player when driving, riding, or operating any other vehicles as it may lead to traffic accidents, which is illegal in some regions." "Press power/stop button to turn it on while the player is off." "Expect in record mode, long press power button until the letters of "Bye Bye" appears and the screen will turn dark, the player will be powered off. Fortunately, although this manual is written in bastardized english, it's not too hard to decipher what it's trying to tell you since it includes screenshots, and the selections on the player's display makes it pretty self-explanitory. "How to use photo impression down all the photos to photo impression." "restart the computer after finish the installation of the software. The page which enable you to set up the installation path will be displayed." I may be wrong, but those don't look like questions. 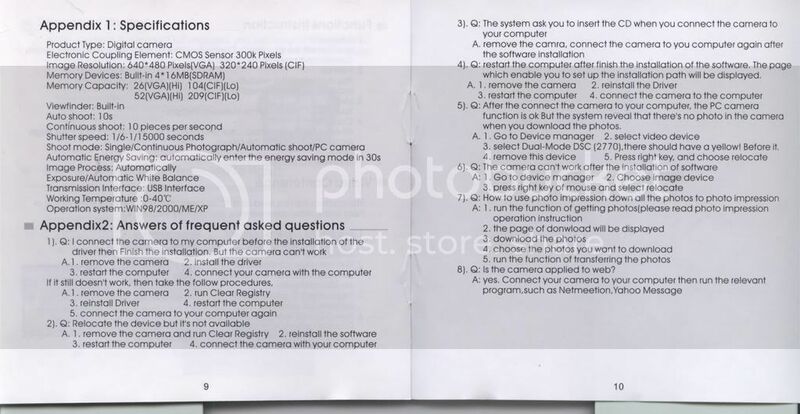 I had one hell of a time trying to get this camera to work since the LCD only displays numbers and icons and the manual was obviously no help to me. After it claims that the item "is not a pacifier or a toy", it warns you not to tie the pacifier around the baby's neck. Somebody will eventually get sued for writing incoherent instructions to accompany their product. And finally, I bring you a fortune I got in a fortune cookie. I keep this in my wallet and read it when things are making too much sense. Just for the hell of it, I approached the chinese guy at work to help translate the message this thing is trying to convey. The scary thing is he understood it perfectly and was puzzled by the fact that I couldn't understand it. Go figure. In this Christmas I have also got so many exciting gifts that I was willing to get from a very long time. In all those gifts one was the most amazing one that I have got from my mother.